For me, the defining moment of this Formula One season came on lap 72 of the Hungarian Grand Prix. With both drivers' and constructors' titles effectively locked away, Ferrari's only remaining task is to ensure Rubens Barrichello is runner-up. So Barrichello was told to win the race and Michael Schumacher to finish second, and this they duly did with predictable and crushing ease. Soon the red cars were so far in front that they were able to ease right off, circulating comfortably in the 1min 19sec bracket. Then, with five laps to go, Michael Schumacher suddenly did one lap in 1min 16.2sec. 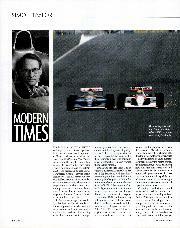 It was easily the fastest of the race – Ralf Schiunacher's best that day was 1min 17.7sec, Coulthard's 1min 17.2sec. It was quite unnecessary for Michael to do that balls-out lap. But he wanted to remind everyone that, even when obediently following orders and staying in second place, he is world champion because he is the fastest driver on the grid. On an afternoon which had brought another demonstration of Ferrari superiority, it was Michael's own demonstration of Schumacher superiority. All rather depressing, for in one single lap it summed up the story of 2002. Spa two weeks later brought more statistics – Schumacher's 10th win in one season, Ferrari's 50th consecutive podium, and their sixth one-two in the past 11 races. 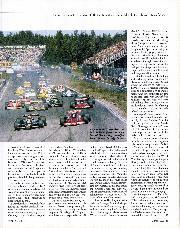 It also brought another race whose result, once the field came out of La Source on lap one, was never in doubt. Already there are concerns that next season will be a repeat of this one. 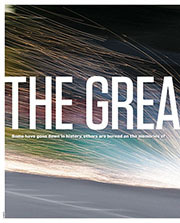 Except: both McLaren and Williams are now making brave noises about building radical new cars to turn the Ferrari tide. 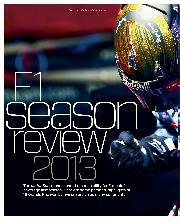 A completely new direction, technically, would be a boost for F1. But I doubt if it's possible today to introduce a truly radical car, one that represents as dramatic a change as Colin Chapman's monocoque 25, or his ground-effects 79, or the first activesuspension Williams, or the first Renault turbo. Today's tightly written F1 rules do not encourage Chapman-like lateral thought. And the risks of costly failure with a radical car are so great that most designers prefer to play safe and copy others' success. Recently a Japanese motor-racing magazine took identical photos of all the current F1 cars and printed them with colours and logos removed, so that each car, and its driver's helmet, appeared white. They then showed the pictures to every driver – and almost none of them could identify their own cars. In fact, if you painted a Ferrari black with a big yellow KL on the side, or decked out a Minardi in red with Marlboro, Shell and Vodaphone stickers, few spectators would realise that anything had changed – as long as the cars were stationary, anyway. Same with a yellow McLaren, a black-and-silver Williams, a green Jordan or a blue-and-yellow Jaguar. As well as the mandatory V10 engines, all have side radiators, high narrow noses and similar wings and cockpit shapes. The difference is in the money, and the organisation behind each car. Minardi wouldn't necessarily start winning lots of races if Paul Stoddard could pay the salaries of Schumacher, Todt, Brawn and Byrne, and also had access to the Ferrari wind tunnel and the Fiorano test track. But, in time, they'd certainly move up the grid. In contrast to the essential sameness of today's designs, F1 used to be a breeding ground for truly radical thought. Chapman and Gordon Murray, to name but two, were always original thinkers, and their constant flow of new ideas meant that the shape of F1 cars kept moving on. Some of their brainwaves didn't work, like the non-independently sprung Lotus 57, or the surface radiators on the original Brabham BT46. But some were so instantly successful that the FIA had to step in hastily and change the rules, most notoriously in the case of the Brabham BT46B 'fan car', which won its first race at Anderstorp in 1978 and was promptly banned. Chapman's twin-chassis Lotus 88 never got that far, for it was protested out after only practising at the 1981 Long Beach and Silverstone races. Renault's turbocharged RS01 was a wonderfully brave initiative in 1977. At first it was slow and unreliable. But within two years they were winning, and by 1984 turbos were becoming universal in F1 — and continued to be until banned in 1989. Back when there was no rule about how many wheels a car should have, tyres formed a major part of a car's frontal area, and reducing drag was the challenge. Derek Gardner designed the six-wheel Tyrrell and saw it score 14 podiums in 1976 and '77, including a 1-2 in Sweden. March and Williams both built F1 six-wheelers with four wheels at the back, but then the rules were changed and they never raced. 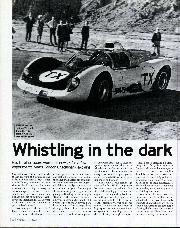 Four-wheel drive occupied first BRM and then Lotus, McLaren and Matra. Cosworth built an experimental car too. At Mosport Park, Johnny Servoz-Gavin became the only man in F1 history to score a 4WD championship point, with Matra's MS84. But improving tyre technology and aerodynamics meant any advantage in grip didn't compensate for the extra weight, and by the end of 1969 the 4WD avenue had become a cul-de-sac. One of F1's most fascinating projects was the Lotus 56B turbine car. At the time there was an equivalency formula setting the size of gas turbine engines in F1, and typically Chapman was the one who explored it. In 1971 he had one of his old 1968 Indycars rebuilt to F1 spec. Before its first grand prix, he decided — for reasons which would now seem totally unfathomable — to let a journalist drive the car so it could gain some publicity. 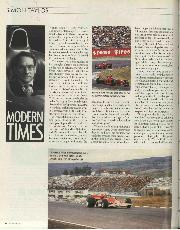 As editor of Autosport I was the only staffer on the comics of the day with a racing licence, and I had a phone call from Lotus team manager Peter Warr, who told me to present myself at Silverstone the next day. Today, that would be like Ron Dennis asking a humble scratcher to drive Adrian Newey's latest before the Australian Grand Prix. I didn't really believe it even then, but I didn't need asking twice. It was, I suppose, the scoop of my journalistic career. 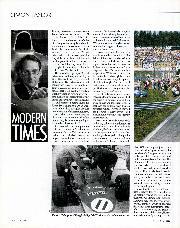 After a detailed briefing from Warr and the car's designer Maurice Phillippe, I was sent out for 15 laps during a general session, sharing the Grand Prix circuit — induding the old chicane-less Woodcote — with Ronnie Peterson's March 711, Graham Hill's Brabham BT34 and Howden Ganley's BRM P160. My abiding memory over 30 years later are of the eerie whooshing silence (except when the others came past). Pounding down the Hangar Straight with 92 per cent showing on the power turbine gauge (which I later discovered, with the help of Maurice's slide rule, was 164mph) the loudest sounds were the big Firestones thumping and chirping over the tarmac, the body panels shifting against the monocoque under braking, and the wind buffeting around the cockpit. I felt rather than heard the turbine shafts whirring behind my shoulder blades at 40,000rpm, heating the oil around the bearings, so I was told, to 1000 degrees C. No gearbox, of course, allied to a complete lack of engine braking and serious throttle lag. You had to brake early with your left foot and almost at once, while you were still braking, plant your right foot on the throttle and wait for the whistling to rise in pitch and restore the push behind your shoulders. At my speeds, the car, with its four-wheel drive, seemed to understeer heavily, although Emerson Fittipaldi had already spun the car at Brands Hatch. "If you get into trouble," I was told, "lift both feet off. The throttle can't help you, and do not hit the brakes, or it'll tie itself in knots." As well as four non-championship races, the 56B was raced in four grands prix, usually alongside the 72s. But for Monza, where Team Lotus was still the subject of legal action after Jochen Rindt's fatal accident a year before, only the 56B was sent, under the World Wide Racing name and painted gold. Having qualified 18th, Fittipaldi finished a brave eighth, one lap down. I don't think that even Chapman thought his turbine F1 car was ever going to win any races. It was just something else that his fertile brain wanted to learn more about. Such an experiment couldn't happen in F1 today: and it's probably just as well. If it worked, the rich teams would just spend even more money, copying. But how splendid it will be if the brilliant design teams at McLaren and Williams do come up with something for next season which manages to be within the rules, and competitive — and really different. Then, perhaps, the 2003 season could be rather more entertaining than this one.